Hey Rebels! Today we chat with Theresa Delaney. In today’s episode we talk all about teaching what you know, and all the things involved with hosting a workshop. Theresa is the founder of Creative Tribe, a monthly workshop series for women to gather offline, foster their creativity and build relationships. She’s a self-proclaimed creativity enthusiast and loves watching it help people make lasting connections. When Theresa’s not planning workshops, you can find her working with clients on their brand identity, watching Harry Potter or petting the dog that just walked by. The Creative Tribe Workshop Studio. Follow us on instagram (@creativebizrebellion) and use code #creativebizrebellion for a shop shout out!!! Caroline and I have both been on Etsy a long time. We know the ins and outs and we know what will get shops noticed. 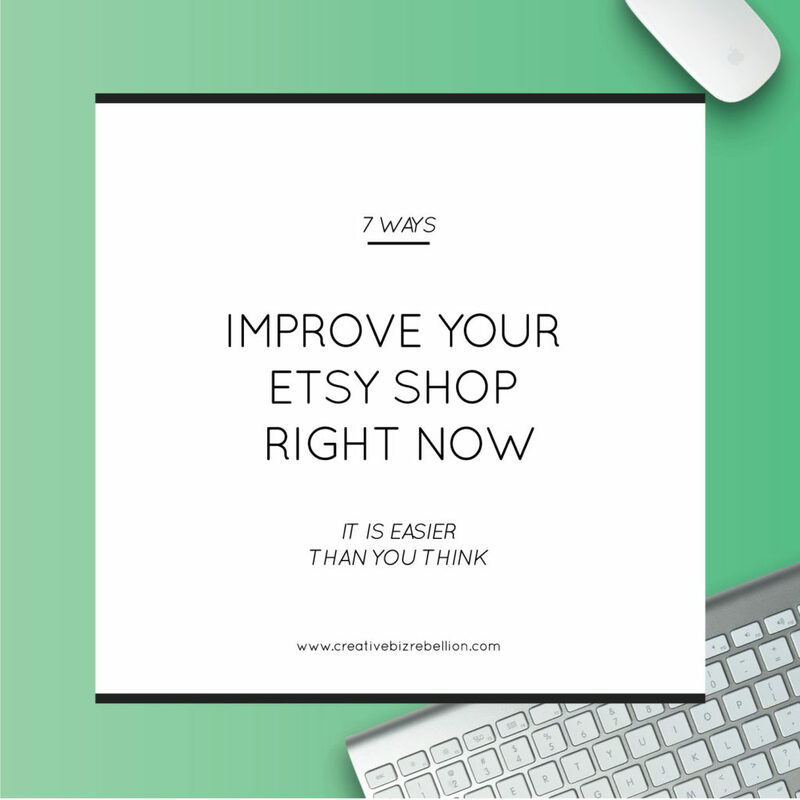 It’s not hard to stand out on Etsy when you put in the work, do your research and educate yourself on all things Etsy, but if you don’t have that kind of time here are 7 ways you can improve your Etsy shop right now! Fill it up – Etsy is constantly spending their money on making improvements. They want you to take advantage of their new features, they want you to use them. You can improve your shop tremendously by completing your about page, using Etsy’s simplified policies, and by filling out all of the FAQ slots that Etsy gives you. Etsy was very forward about the fact that they gave a little boost to the shops who switched over to their simplified policies a couple years ago and to those who have completely filled in their about pages. Have Great Pics – This is so very important! Your titles and tags will get you to rank higher in search, but to stay there, your photos need to be so good that customers can’t help but click on them! When customers are clicking and favoriting your items your sales and therefore your search rank will improve. Engage on Social Media – Get your listings in front of customers as much as possible. 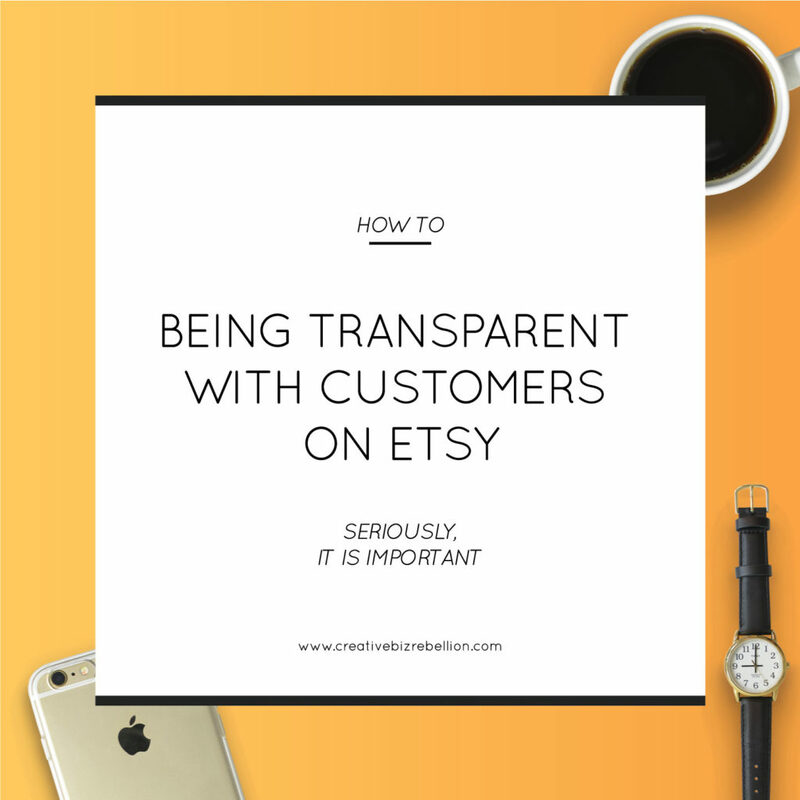 Getting people to view your shop and, more importantly, favorite and purchase your items will greatly increase your sales and your exposure on Etsy. Etsy LOVES activity! Right now, I use Instagram and Pinterest with great success. Another fabulous way to promote yourself is through YouTube. Set up a channel and do some how-to videos or answer frequently asked questions. You can’t lose – it’s free. Collaborate and Educate – Meet other Etsy shops online, participate in local craft/art/wedding shows, join an Etsy team, take a class, find Facebook Groups, partner with bloggers, and simply give back to others. Offer advice, assistance, or engage through favoriting other shops, liking and commenting on other people’s pictures on Instagram. Always remember that no matter how new you think you are, there is always someone who is just starting out and knows less than you & may need your help. Share your knowledge – trust me, it goes a long way! Coupon Codes – People love coupons! I do not use coupons often because if you discount too much your customers will always be looking for a bargain. However, used sparingly, they can be really beneficial and setting up a coupon code is so easy! To take advantage of coupon codes, you could have a grand opening or an anniversary sale and blast it out on social media. You can also do what I do and offer a coupon code to customers as a thank you. Etsy will even send it to them automatically in your thank you message. This has really built my repeat customer base. Finally, when running a coupon code, make sure that you put it in your shop announcement or on your banner. Educate Yourself – Etsy can be overwhelming and with all the new updates that are rolling out in May of 2017 like the NEW Etsy Shop Manager it seems almost impossible to be seen. FEAR NOT! I can help you! I have created a new course for Etsy Sellers called The Etsy Action Plan. 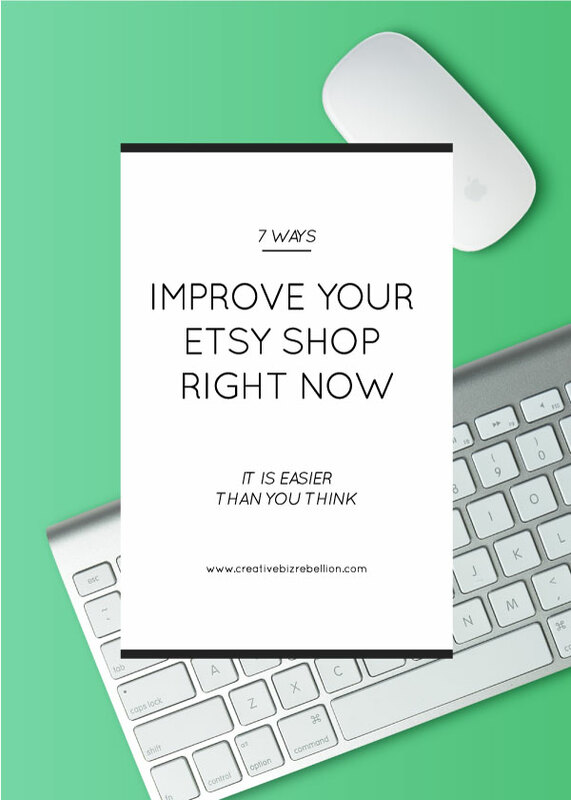 The Etsy Action Plan takes you step by step through setting up and maintaining a profitable Etsy shop. I even take you behind the scenes of my own Etsy shop, Hello World Stamps, to show you how to optimize your shop to get more views, more favorites, and more sales! YOU have to put in the work, but I can show you what to work on and what not to waste your time on, so go check it out! You are looking at your release schedule and you know that you HAVE to get some designs down or new products added to your line. You have tried to sit down and think up some new amazing ideas but your brain is completely blank. Ugh. Let’s all take a minute to take a deep breath. It will be ok.
You can get out of this mode. 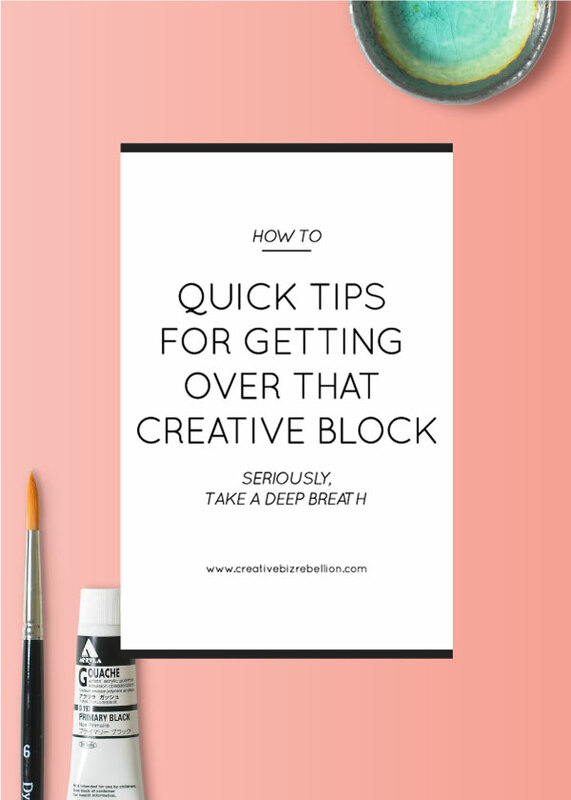 Here are some quick tips for getting over that creative block. – Go for a Walk or get out of the house. There is nothing better than a change of scenery for the creative. Take it up a notch and go to a museum or place of beauty that speaks to you. Can’t make it there? Look at some really inspiring pictures. For me, I like to revisit my trip to Colorado. *sigh* Something about those mountains gets the juices flowing every time. – Focus on what makes your brand different. I literally keep a note in my phone that describes my business in 4 words. Whenever I get stuck, I look at that and think to myself “how can I meet this right now.” It has been a total game changer and has helped my line grow in the right direction. Write down what makes your brand different and remind yourself when you get stuck. – Do something different. Sometimes the best cure of lack of creativity or direction is a new experience. Try a new restaurant or go to a new city for a quick visit. Experiencing something new will give you something else to draw on for inspiration. – Learn a new technique. If you are a maker, maybe it’s time to learn something new. As a designer, I am always seeking new ways to do things. Right now, I’m really focused on my hand lettering and improving that. I love trying new pens. In fact, it was a new pen that inspired several best selling designs. – Change your music. Do you listen to music while you work? I sure do and the number one thing I find when I’m stuck is that I need to change my music. Try it! It’s amazing. You can check out my monthly playlists here. 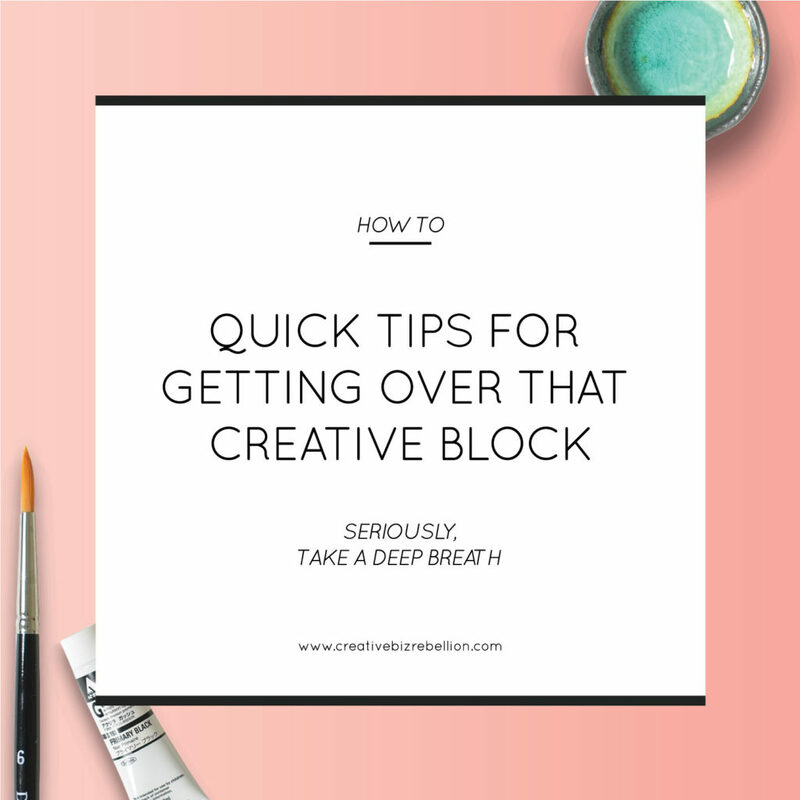 The important thing to know is that creative blocks are normal. The key is to not let them defeat you. Take control of them. Another great way to tackle creative blocks is to do so with a community. Join the free Facebook Group by clicking here. Hey Rebels! 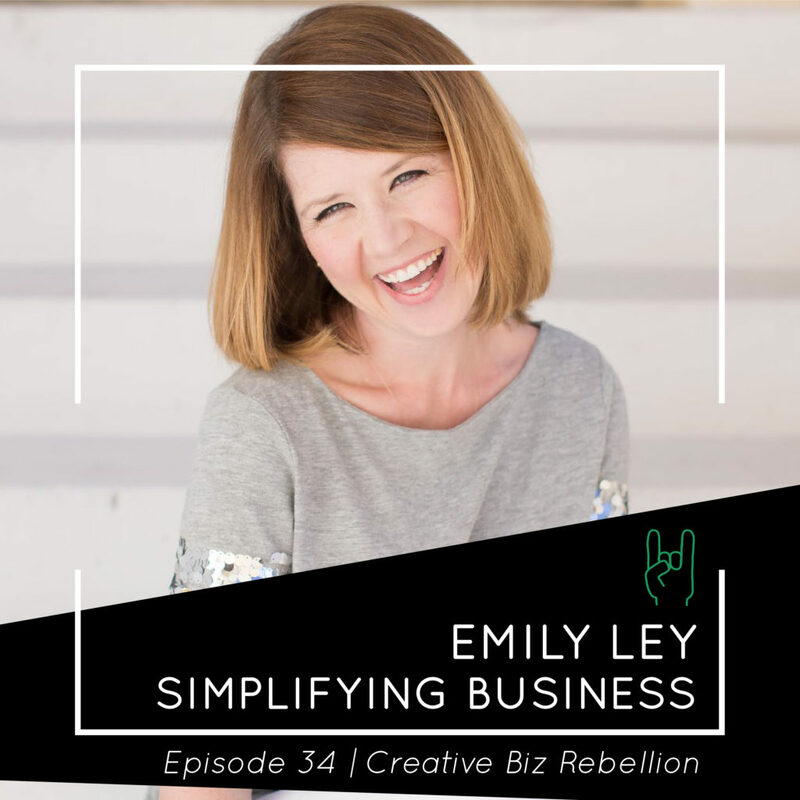 Today we chat with Emily Ley. Emily Ley is Founder and Creative Director of Emily Ley Paper & Gifts. She is also the creator of the bestselling Simplified Planner – a daily agenda for what matters most – and author of “Grace, Not Perfection: Embracing Simplicity, Celebrating Joy.” Raised in Pensacola, Florida, Emily graduated from the University of West Florida with degrees in English, creative writing, and public administration. She would later become the executive director of the city ballet. From there, she worked in nonprofit management and public relations before launching her brand in 2008. Emily has been recognized with numerous awards, including Best New Product at the National Stationery Show as well as being named a Top 10 Designer to Watch in 2015 by Stationery Trends Magazine. Emily lives with her husband and three children in Tampa, Florida. For more information, please visit www.EmilyLey.com. I’ve Made Mistakes and So Will You. I hate to be the bearer of bad news, but making a mistake somewhere at some point on your creative biz journey is inevitable. However, there is one thing I can say that has helped me to breeze over my mistakes and keep going without losing my mind. I am honest with my customers. 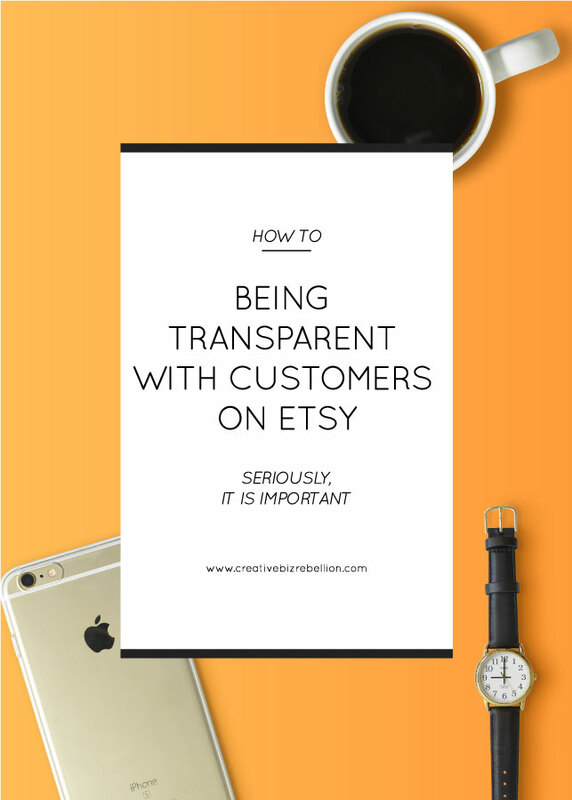 Transparency in your business is a good thing since customers flock to Etsy for the personal experience, so embrace it. Most Etsy customers know that they are ordering from real people, with real families, and real lives. Let them see you for everything you are. You are creative, you are driven, you are organized, you are focused, however you are not perfect and MOST people get that. Be upfront with people about what materials you are using, what your turnaround times are, and if you make mistakes. Yep. Tell them. There will come a time when you mess up. It may be in the beginning or it may be down the road, but it will happen and then it will happen again. We are not perfect and that is ok.
I’ve made mistakes before. For example, one time I neglected to send someone their proof for their stamp within my promised 2 business day window. I had marked that I sent them their proof on their order, but in the routine of it all I forgot to actually send them the message. Unfortunately, I didn’t discover it until a week later. #$@&!! Believe me there was a lot of profanity streaming out of my mouth. I was so mad at myself for neglecting a key step in my process. So what did I do? I email the customer and told them what happened. I said, “I’m so sorry, but I have just discovered that I have neglected your proof! Please accept my sincere apology. Your proof is attached and I will upgrade your shipping to Priority Mail free of charge.” I was so worried about it and the customer was so understanding. She told me not too worry and that she appreciated the upgraded shipping. SUCCESS!! It is always better to be honest than to make up an excuse like Etsy sent you the order late (which doesn’t happen) or your package is on the way (when it’s not). Always, always, always be honest with your customers. They will appreciate it and in the rare case they don’t just let it roll off your back because just like we are not perfect, our customers are not perfect either. If you want to learn more about running a profitable and organized Etsy shop please check out my new course Etsy Action Plan!